Shares of Archrock gained 75% despite a significant dividend cut in 2016, which could set it up for strong returns again this year. 2016 was an interesting year for Archrock (NYSE:AROC) and subsidiary partnership Archrock Partners (NASDAQ:APLP). After going public in late 2015 with the intent to capture the need for compression services in the oil and gas industry, it got immediately slammed with market troubles. 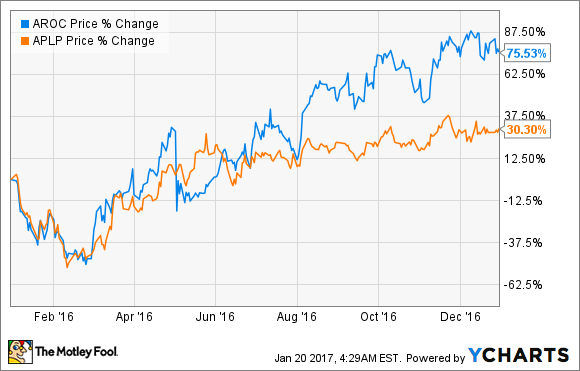 Despite this, Archrock was able recover from a tough start to the year to post an impressive gain of 75% in 2016. Even though Archrock's stock gained big last year, there is a possibility that both it and Archrock Partners could have another good year ahead of it. Let's take a look at what happened this past year and why it could be set up for an impressive 2017. In November 2015, Exterran Holdings split itself into two separate businesses. The legacy-named business kept its product design and manufacturing, aftermarket services, and international contract operations. Archrock took its fleet of compression equipment and became wholly focused on contracting its compression equipment to oil and gas companies and providing contract services exclusively related to U.S.-based compression. In some ways, this seems like a slam dunk investment. Cheap natural gas from shale has created a boom in demand for the product and has lifted total production significantly in recent years. To move all that product, it requires a lot of investment in pipes -- and compression equipment to keep it moving in those pipes. As in so many other companies, though, the devil is in the details. While Archrock is mostly responsible to the service end of the business, the physical equipment is owned by its subsidiary partnership, Archrock Partners, and Archrock periodically drops down other equipment assets to the partnership. The combination of going public in late 2015, a drastic slowdown in gas production and volumes from weak pricing, and a less-than-desirable balance sheet out of the gate immediately meant that Archrock Partners' distribution was in a bit of trouble. Quickly responding to this situation, management decided to cut Archrock Partners' distribution by 50% in the first quarter of 2016 in an effort to pay down debt. Its parent company was also forced to cut its own dividend as a result. The goal of the cut is to get the company's total leverage ratio down from its high of 5.4 times to 3.5 times by the end of third-quarter 2017. Here's what's strange about all of this. By any means, such a move would send shares of a stock plummeting. After a big drop immediately following the announcement, though, shares of Archrock shone for the rest of the year and significantly outpaced the broader market. Most companies in the oil and gas logistics business have room to grow, but it is normally a very paced growth rate. That being said, Archrock has the ability to tap into a specific part of the market in the coming years with much more growth ahead of it: infrastructure for the Marcellus and Utica shale basins. The Marcellus and Utica shale are both gas-heavy shale formations that are proving to be very prolific and economical. That could be said for a lot of other shale basins. What makes these two unique, however, is that they are in places where oil and gas infrastructure are much less developed than in places like, say, Texas. As a result, billions of dollars are likely going to get poured into infrastructure to deliver that gas to centers of demand such as the U.S. Gulf Coast. That takes a lot of compression horsepower, and Archrock's current footprint there is certainly wanting compared to its assets in other shale basins. Image source: Archrock investor presentation. In 2016, Archrock and Archrock Partners have done what they can to improve their financial position, but there is only so much that can be done when drilling activity grinds to a halt and production across the U.S. wanes. One way it has helped to improve the company's financial structure is that Archrock has been dropping down assets to Archrock Partners in exchange for shares in the subsidiary. Higher operating revenue without additional debt for these assets and a low distribution payout for those shares should help the partnership right the financial ship. Also, with oil and gas production on the rise again, Archrock could be in a much better position to capture that growing market. A company slashing its payout is by no means a good thing, but to see Archrock's management so quickly reset its payout to address its financial situation before things got really bad is good sign for the future. It may take a couple more quarters for the company to get its balance sheet back to its target range. Once it does, though, there is an immense growth opportunity waiting to be captured. In the meantime, Archrock and Archrock Partners currently have dividend yields of 3.2% and 6.6%, respectively. So even at today's reduced payout structure, you are getting a decent amount of cash to stick around for better times ahead. If the company can stick to its debt reduction targets in 2017, the company could have another good year ahead of it.